Keri has shared her Method dish soap review. I went looking for a more natural dish soap after I drank water out of a cup that had a soapy taste and obviously had not been rinsed well. I thought about the fact that we were probably ingesting chemicals whenever this happens, so I wanted to find the most natural dish soap I could find. Method turned out to be a great find. I use the Cucumber scent and think it smells very refreshing. It is also very gentle on my hands even though I have sensitive skin. It works awesome! It is also reasonably priced compared to some other natural dish soaps. I've recently seen they've changed the design of their bottle, but I've only used their old bottle, so I can't comment on the new design change. I do like the idea of the pump, anyway. But have not tried it yet. 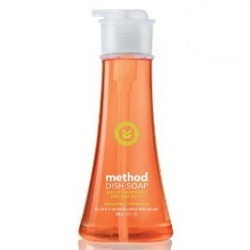 I will definitely continue to use Method as I am very happy with this as well as many of their other products. Keri, thanks for your Method dish soap review. There are mixed opinions about the pump dispenser for the laundry detergent (see see here for discussion in some of the reviews), so I will be interested to hear what others think of the new pump dispenser for the Method dish soap. If you have used the new pump, please share your natural dishwashing liquid review of this, or any other brand, telling me what you like, or don't, about it, and why. 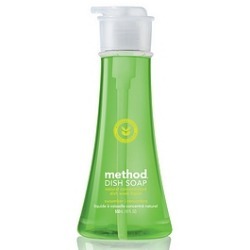 In addition, I would love to hear more reviews of Method products. You can share your Method cleaning products review here, or read other reviews already submitted. Join in and write your own page! It's easy to do. How? Simply click here to return to Method cleaning products. Angela has shared the pros and cons of Method brand dishwashing soap, in the Clementine scent. PRO'S: Love the scent, foams well and cleans well. CON'S: The pump dispenser. I'm not sure how this pump dispenser is designed but when you push down on it, it can shoot across the room almost! You've really got to have great aim when you push down. This can lead to a lot of wasted soap. I'd prefer to buy the refills and then refill another dispenser with the soap. Thanks Angela for your Method dish soap review. I am glad someone has now shared what they think of the new dispenser pump, since this change was relatively recent, and the only other review I had received said she hadn't tried the new design yet. I would love to know what other people think about the new design of the dishwashing liquid bottle, and whether it is good or not. I like your idea though Angela, of just getting a refill and using your own dispenser for it if you don't like their design. That is a great way to continue using the dish soap, since you like it, without the pain of using a dispenser you don't like. Fortunately, refills are available for the Method dish liquid, so this is a viable option for you. If you have used this product, or the new dispenser pump, please share your review here, telling me your opinions about it. In addition, you can share your dishwashing soap review here, for any other brand, or read other reviews which have already been submitted. I decided to begin trying different dish soaps after following Taylor's lead. I had not given much thought to dishwashing liquid before, and it made me wonder if I might be missing out on something. I was curious and wanted to know the pros and cons of all of them. I tried the Method Clementine dishwashing liquid in the pump dispenser. Over all it was a decent product. I did notice though that with really greasy dishes, pots, pans, etc. I had to add more soap to my wash water or put it directly on my sponge to finish tackling the grease. It also left my sponges with a rancid odor after a few uses. I too also had problems with the dispenser, as others have mentioned. It's not a bad dish soap, but factoring in the cost as well as my results from my use of it, I won't be buying it again. Lemon Mint Method Pump Dish Soap Cleans Great But Dispenser Is Not Good! I recently finished a bottle of this dishwashing liquid, and wanted to share my thoughts about it here. I have to agree with the reader above, who said that the pump dispenser for this eco-friendly soap is poor. Both my husband and I have been washing lots of dishes by hand recently, because our dishwasher has been broken for about a month (finally have it fixed, but that is another story). We both liked the scent of this soap, and the way it cleaned. It wasn't too thin (one of my pet peeves) and seemed to get rid of grease well. However, we both got quite exasperated trying to use the product because of the dispenser. You've got to hold the bottle exactly upright, and can't have it tilted at all or it will squirt all over the place, not just on the dishes. Also, if not exactly upright you may not even get any soap at all out of it if the end of the straw is not in the right spot. It really ended up being a hassle when your hands are all soapy and slick while washing dishes, and made the process less enjoyable than it otherwise could be. Overall, I won't be using this product again, not because it didn't work well, but because of the design of the dispenser. 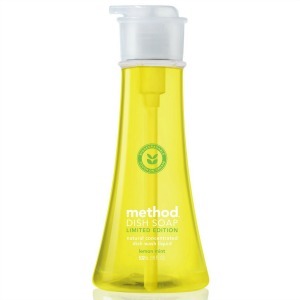 Overall, Method is known for its clean design just as much as its products, but this time they got it wrong in my opinion. I would be curious to hear if others feel the same way or not about it. You can share your dish soap reviews here, for this or any other brand, or read others that have already been submitted. Comments for Lemon Mint Method Pump Dish Soap Cleans Great But Dispenser Is Not Good! Method is the only thing that doesn't tear up my hands. Everything else's can make them crack and bleed. I love Method Clementine scent. Despise the pump. Sigh. I also use the Method Clementine, but I love the pump it comes in! I make sure that I turn the pump tube so it faces the same direction as the pump dispenser so when I tilt the container I always get down to the last drops of soap before I have to refill! I have used this for a few years now. I love how it smells and that it cleans the dishes, but doesn't dry out my hands. I haven't had any problems with the pump nor has my husband complained about it. I get the refill bags, so the pumps get used more than once. I got my first few bottles for cheap at a liquidator store, so I have a few extra pumps, but they seem to last okay.